BRAES members are constantly conducting exciting and impactful work across all our research themes. Read on for a window into some of the novel topics our researchers are currently exploring. My research field is called ‘ecocriticism’, which is the literary branch of the ‘environmental humanities’, ‘a range of multifaceted scholarly approaches that understand environmental challenges as inextricable from social, cultural and human factors’ (Neimanis et al. 1970). While ‘the environment’ is often approached as if it were strictly the domain of natural scientists, it is important to distinguish between ‘problems in ecology’, which can only be addressed by ecological scientists, and the much wider category of ‘ecological problems’, which are ‘features of our society, arising out of our dealings with nature, from which we should like to free ourselves, and which we do not regard as inevitable consequences of what is good in that society’ (Passmore 1974). Cultural differences shape the ecological problems we identify, and also the kinds of solutions we propose and accept. For example, Germany is phasing out all its remaining nuclear power stations, whereas France gets 85% of its electricity from nuclear and has experienced little social protest on the subject. Similarly, Zhou’s analysis of data from 32 countries found that Canadians expressed the least environmental scepticism and Filipinos the most – but he also found no macropolitical differences that could explain the disparity, and concluded that the ‘variation may be due to unique historical and cultural contexts of individual countries, and cannot be simply attributed to national differences in affluence, world society connections, ecological conditions, and levels of democracy’ (Zhou 1973). Even the things we call ‘the environment’ – the very boundary-lines of ‘nature’ itself – are shaped by our cultural history. So my research, whether it’s on environmental literature, or novels about dogs or whales or chimps, or the phenomenon of climate scepticism, is about environmental imaginaries – which are not at all separate from the material realities studied by colleagues in the natural sciences. Neimanis, Astrida, Cecilia Åsberg, and Johan Hedrén. “Four Problems, Four Directions for Environmental Humanities: Toward Critical Posthumanities for the Anthropocene.” Ethics & the Environment 20.1 (2015): 67-97. Print. Passmore, John Arthur. Man’s Responsibility for Nature; Ecological Problems and Western Traditions. London: Duckworth, 1974. Print. Zhou, Min. “Public Environmental Skepticism: A Cross-National and Multilevel Analysis.” International Sociology 30.1 (2015): 61-85. Print. For more information about Dr. Garrard please click here. I am a soil microbial ecologist who is interested in how soil microbes can be used to promote sustainable land use. 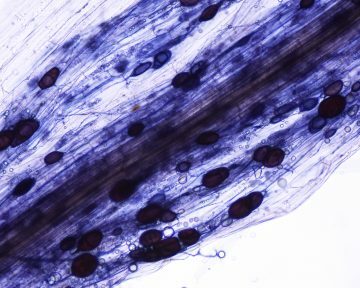 My primary focus is on arbuscular mycorrhizal communities”. I have several projects looking at the efficacy and fate of commercial inoculum in agricultural systems, both grain agriculture and viticulture. Plus, we are looking at how soil biology can maximize restoration success post mining. We are also trying to understand how humans have changed soil biota – if there are any ‘wild’ soils left, and if so, how they differ from disturbed soils. For more information about Dr. Hart please click here. I am an aquatic ecologist. At the moment my research efforts are oriented towards using Next Generation sequencing and classic ecological techniques to document the structure and properties of prokaryotic communities found in freshwater and saline lakes, and attempting to apply some of the established principles of ecological theory to the microbial community scale. Recently I used mesocosm experiments to determine that the epilimnetic prokaryotic plankton communities of three closely located and linked freshwater lakes are distinct, and that these communities remain highly identifiable to lake despite moderate disturbance. What limnological parameters are primarily responsible for conferring distinctiveness is yet to be determined, as is any functional differences that might exist among the communities. Currently, an Honours student and I are investigating methods for running transplant experiments of plankton from one environment into mesocosms of different aqueous environments. 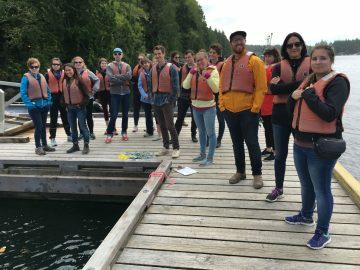 The project involves transplanting communities from local saline and freshwater lakes into the water of a local brackish lake, one which reconnaissance work has indicated to be remarkably depauperate in microbial life. Finally, in an attempt to return to my fish roots, I would like to run future studies investigating the gut microbiome of different life-history types of Kokanee and Sockeye Salmon.